Charissa, Jaye, Jillian, Yahong, and Doreen! Congrats again, Charissa, Jaye, Jillian, Yahong, and Doreen, and thanks so much to everyone who entered and helped spread the word about this giveaway! 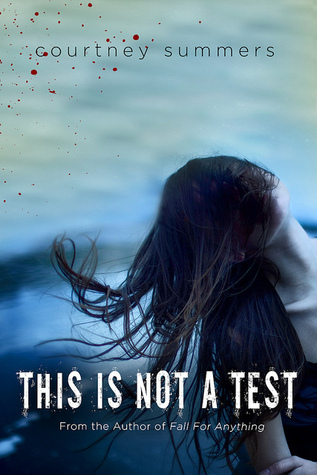 Second, my first post over at YA Confidential is up today, a review of the fabulous This Is Not a Test by Courtney Summers (out next month!). I’d love it if you’d drop by to check out all the reasons I LOVED this book! Third, I’ll be taking a bit of a blog-cation over the next couple of months. Yep… April and May were chock full of blog posts around here, and I had a blast writing them, reading all of your thoughtful comments, and visiting your blog in return. But, I’ve decided to dedicate my free time this summer to my family and the rewrite I’ve been working on. Blogging is a blast, but it’s also quite time-consuming, and if I don’t take this break, I won’t be able to prioritize my time in a way that will best allow me to complete my rewrite. That said, I’ll still be reading your blog, and I’ll still do an occasional Bookanista review. I’ll also still be posting over at YA Confidential. But all in all, things around here will be pretty quiet. Never fear, though… I’ll be back early August when school starts and my girlie begins spending her days at –*gasp*– Kindergarten! I leave you with this question: What are YOUR summer plans? We’re going to miss you but you’re family is so much more important. These are times you can never get back. Enjoy your ‘freedom’ and your summer. We’ll be here waiting for you. I have no plans but to write, finish a couple of novels and hopefully find a job. Hugs to you and your family. See you in August! We’ll miss you, but I definitely understand the need to spend time with family and with writing. Blogging really is time-consuming. I plan on doing a little traveling this summer and hope to get a lot of writing and reading in as well. Thanks, Dana! Enjoy your reading and your traveling… I’m a little envious! My summer plans are official – I’m going to Europe/UK for 2 weeks in AUgust!!!! And hopefully find a job and move back to the Boston area. 😀 Oh, and finish my novel. I’m sad things will be quiet around here, Katy because I love your posts but I definitely understand. Thanks so much, Rachel! I’ll miss the blogging so I’m sure I’ll drop in occasionally, but finishing this rewrite and family time are very important to me right now. Enjoy all of your traveling… You’re going to have a BLAST! Can’t wait to hear all about it! I’ll miss your posts! But I definitely understand. I try to get in at least one post a week and even that can be a struggle. I’ll be writing this summer. I’d like to finish my rewrite by summer’s end and start querying, but we’ll see 🙂 Have a great summer! Thanks, Liz! Good luck with your rewrite… Solidarity, friend. 🙂 I hope you get to start the query process soon; I can’t wait to hear all about it! I will definitely miss your posts! I really enjoyed reading all your blog posts and getting to know you. 🙂 But I totally understand. Blogging IS time consuming. No plans for me this summer… just the usual working. When you work full-time in an office, with no vacation days, summer really isn’t a big deal. I am moving at the end of August, which I’m totally dreading. 😦 I really don’t want to move because I love where I live! Thanks so much, Zanne. ❤ Having just survived a move, you have my sympathies… I hope it all goes smoothly and you learn to love your new place. Happy writing and reading! I’m going to be taking July off myself–that’s when I’m heading to Hawaii to get hitched! Hawaii! Wedding! Your summer is going to be amazing, Rebecca! I cannot wait to hear all about it! Totally understandable, Katy. 🙂 Though, we’ll miss you horribly around these parts. I know Blogging from A to Z just about did me in, as fun as it was. Hope you have a great summer writing and spending time with your family. Yay for writing and revising, Jaime… I’ll be right there with you. Here’s to hoping you get to query soon… I hope to hear all about how it goes. Fingers crossed for you, and enjoy your summer! I’m possibly going to work again at the local Orthodox day camp. I had a lot of fun as a counselor there last year, in spite of a few difficult kids, and got to take a lot of fun day trips with the campers. I hope one of this year’s field trips returns to the mid-sized hobby farm we all loved so much last summer! I’ll possibly be taking a graduate-level class in children’s literature at the state university’s library science department, in preparation for possible matriculation. I also hope to finish both of my WIPs, a 1940s historical and a 1980s historical, and start querying the first volume of the 1940s historical this summer. If I’m lucky, I’ll be finished in time to start my third Russian novel by the end of the summer. That one’s going to need my full time and attention, given the scope and breadth (I’m predicting at least 450,000 words). I hope you have a great vacation and enjoy your down time. I’ll look forward to your YA Confidential posts. Ooh, day camp sounds fun! You’re going to be incredibly busy. Good luck with your WiPs… each one sounds fascinating! I’m going to miss your posts but a summer off to enjoy the family and writing sounds amazing. Enjoy it!! Yay for querying! Good luck… I’ll keep my fingers crossed for good news. And enjoy your family time. I’m looking forward to doing the same! I’m probably going to end up taking a bit of a blogging break, too. I won’t totally go away, but there’s no way I can keep posting every day. My summer is SLAMMED. Almost every weekend is already totally full. I’m going to ALA, going to San Diego with my girlfriends, going to Europe for a week with my husband and then staying in Paris for 2 weeks to start my MFA program, then I come home and head straight to SCBWI LA, then to Vegas for our wedding anniversary. By the time I’m done with all of that it will be time for me to start school again! It’s going to be a fun summer, but REALLY exhausting. Enjoy your family time, Katy! Yea! I won! I’m so excited. Have a fun summer with your family and rewrite! Blogging does take a lot of time (it’s surprised me how much). I’m excited to go camping and maybe (frown) get the garage cleaned up (doesn’t get much more fun that that). Hey Katy! I am going to be poolside as much as possible this summer! And writing/working/mothering etc. Congrats to your winners and see you over at YA Conf.! Sounds very similar to my summer, Marsha. Lots of writing/reading/and hanging outdoors with my girl. Really looking forward to it! Yaaaay for giveaways! Thanks so much! Now if only I’d been more on the ball this week… Good thing they’re all fun prizes. Thanks, Jillian, and thanks again for entering my giveaway… Congrats on winning! Yay! Bumber sticker – so psyched and thank you! Thanks for entering, Jaye… Your sticker went into the mail today! Three vacations… Lucky girl! Enjoy your time with your kiddos… I plan to have lots of quality outdoor time with my girlie as well! Nothing official, but I’d love to finally go to the Summer Exhibition at the Royal Academy of Arts in London, go to the beach and eat ice cream and play in the sea, and generally get some sun. Have a great summer, enjoy the time away from the blog!